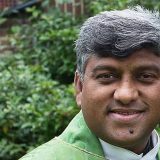 Revd Rana Khan was born born and raised in Vehari, a small town in Southern Punjab, Pakistan, and trained for the priesthood in Karachi, and worked for 10 years in the Diocese of Lahore in both urban and rural parishes. He was invited by then-Archbishop of Canterbury, Dr Rowan Williams, to join the team at Lambeth Palace and moved, with his family, to the UK. He is married to Moseena and they have three sons. Rana was inducted in May 2017 as Rector of Crickhowell, Cwmdu and Tretower and leader of the Catwg ministry area. Rana is taking Monday as his day off, although he will be available should there be a pastoral emergency.